My family was hit with a nasty stomach bug last week. We’ve been subsisting on a tasteless diet born out of necessity–simple carbs and tea. Hubby and I were wondering the question that millions of households in America ask every night–what’s for dinner–we thought why not a soup? As you know, we are a soup-loving family. My husband found this recipe for a delicious restorative soup that takes less than 20 minutes to make. The lemon, nutmeg, and fresh parsley reawakened our palates and were gentle on our bellies. PDot sopped up every spoon full and held out his bowl to ask for more like a modern day David Copperfield. How could this mama llama not brim with love and refill his soup bowl? 1. In a medium-size pot, bring chicken stock to a boil. Season to taste with salt and reduce heat to a simmer. 2. Crack eggs into a medium-size bowl and beat lightly with a wire whisk. Whisk in nutmeg, the lemon zest, salt and pepper, and grated Parmiggiano Regianno. 3. Pour egg mixture into simmering chicken broth and stir gently until mixture forms into a fluffly mass. Simmer for 1-2 minutes. Use a ladle to break up into puffs of dumpling. Add lemon juice to taste. 4. Ladle the soup into individual bowls and sprinkle parsley over each serving. 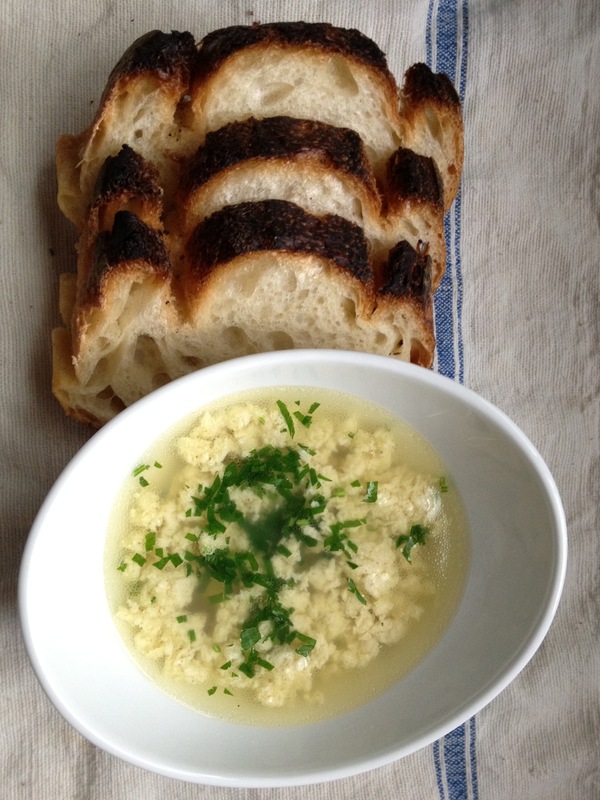 Serve with a crusty sour dough bread like a Pugliese. Enjoy! As a soup lover, you should definitely buy Zuppe. I got it after seeing this recipe last week in the paper. Awesome! Thanks for the recommendation, Daniel. I will pick up a copy. Have you tried any of the recipes? Let me know which ones you enjoy.